Naast events op onze vaste plekken IJburg strand en Amsterdam Zeeburg organiseren we een aantal keer per jaar ook sup reizen naar het buitenland zoals: Slovenië, Bonaire en India in 2019. Uiteraard staan er ook meer bestemmingen op onze bucketlist en zodra er meer reizen bekend zijn plaatsen we deze direct online. Always wanted to explore the beautiful nature and emerald waters of Slovenia? 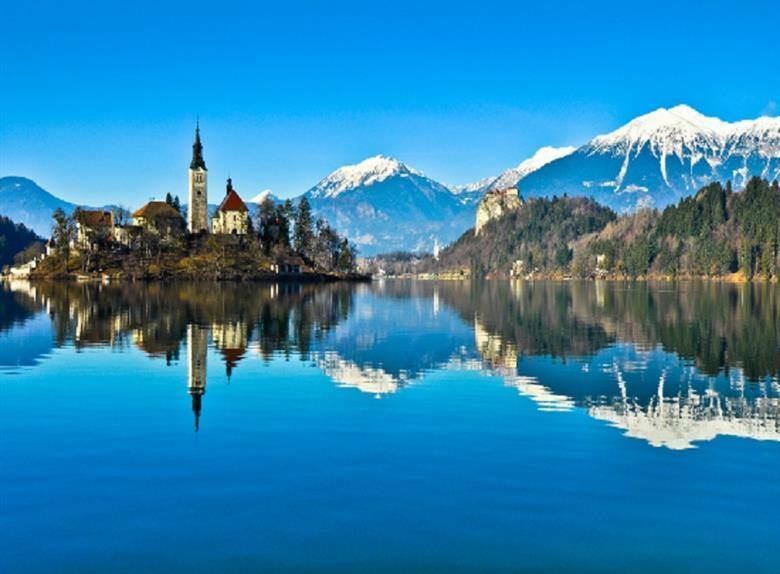 Does lake Bled, turqouise Soča river and the old town of Ljubljana make your SUP mind wander? In coop with Paddle Up Slovenia we offer a 5 day SUP Safari through the country and paddle at the most beautiful and pristine SUP spots Slovenia. Day 1 - Arrival to Ljubljana, preferably early morning flight, put your luggage in the hotel and visit Ljubljana old town individually or as a group, depending on your time of arrival. Meet and greet dinner in one of Ljubljana many delicious restaurants. Day 2 Paddle Ljubljanica river, that meanders through the marshes arround Ljubljana, then we paddle below bridges of Ljubljana to Ljubljana old town. You have two length options longer apr. 28 kilometers downstram, if that's too long we can also make a shorter 18 kilometer paddle. This is to discuss on the spot and each participant can choose one of both distances. After the paddle transfer up to lake Bled area. Day 3 An early rise and paddle the beautiful lake Bled – approx. 6 km. After lunch we will paddle alpine lake Bohinj – approx 10 km paddle or you can choose to just paddle around on your own and enjoy the scenery. Accomodation in lake Bohinj area. Day 4 Take the car-train to Soca valley early in the morning and paddle the turqouis waters of alpine Soča river after arrival. We will decide which route we paddle on the day due to wind and current, approx 12 km paddle. Overnight stay in Tolmin. Day 5 Driving back to Ljubljana area (approx. 3 hour drive) and last short paddle tour at Trboje lake/gorges of Sava river, approx 10 km. After the last sup tour it's time for a lunch at a local restaurant and them pack up and get ready for flights home and we will transfer you to the airport. *This SUP Safari is for experienced paddlers! * Pealse note, that you need to arrange your own full health and travel insurance valid in Slovenia to have full assistance in case you need it. As we need to reserve rooms, van and boards we will ask for a downpayment of 50% as soon as the event has a GO (minimum of 6 people) and the rest of the payment can be done on a later stadium. We will organise this SUP Safari if minimum of 6 persons sign up. Saturday 8th June M&M SUP Amsterdam offer a day filled with yoga, sup yoga and a sup tour in coop with Reyn voor Lichaam & Geest yoga studio. Lunch 13.00-14.00 at a restaurant just around the corner at the waterfront terrace. For this sup & yoga day we do require some sup experience as the tour is two hours and about 8-9 kilometers which is very long if it's your first time! For the yoga part we do not require any experience. As this is an active experience and we like to keep it 'cosy' we can take up to 10 persons. We meet at 10.45 at the sup center: Zeeburgerpad 10, behind the iron fences. There we get ready for the tour. We recommend to take at least two sets of (yoga) clothing with you as you might get wet during the day also bring a towel with you. Depending on the weather take at least one long leg and arm set and one and short leg and arm set with you! We do not use wear shoes on paddle board, but ask you to bring flipflops along as we have to walk a bit on the streets every now and then. All your personal belongings are safely kept at our centre whole we are on our way. We have 10 spots for this day available. Sign up via morene@mm-sup.com , also for any additional questions. Location M&M SUP at beach IJburg Pampuslaan 500, the red container behind the windsurf school at the beach. If you need to rent a board during the certification training let us know via morene@mm-sup.com we can rent you a board for €75 for the entire course. If looking for a nearby hotel also let us know as there are two hotels on walking distance from our center. Always wanted to visit the beautiful country of Israel, paddle the never ending blue shoreline and enjoy the mediterranean climate? We paddled this great country last fall and loved the country, water and activities so we hooked up with with I-Surf surfschool in Netanya and put down a program with enough supping/surfing, yoga and some time off to explore the country and spend some relaxing time at the beach. Program might change due to weather circumstances, we will always offer a replacing activity if we cannot offer a sup or yoga session. every night or morning we will discuss the program at dinner or breakfast. This sup & yoga trip is a GO if we have enough sign ups, deadline for signing up is the 15th July. World Water Day 22nd March is thé perfect moment to kick off the new sup season 2019! We'll go out for a 2 hrs tour in the Amsterdam canals and pick up trash along the way. Windtown South Africa and M&M SUP Amsterdam offer a SUP-YOGA-KITE week 10-17th March at Langebaan South Africa; Windtown beach hotel. Day 3 Monday – 6.45 Early juice and fruits – 7.00 SUP YOGA main beach – 8.00 Breakfast – Free timer lunch – 14.00 Kiteboarding clinic – 18.00 Dinner at Breeze, curry night. Day 8 Saturday – Sleep in late and relax, possible to rent a paddle board book a kiteboarding class or just chill at the beach before taking off. Price €1450,- including 7 nights accommodation, all activities, drinks and snacks during activities, 7x breakfast, 5 x dinner at Windtown and all materials needed during the activities. We also supply a car which brings you to all activities offered. If you book before 15th december 2018 we offer a €200 discount! The rooms are shared with two or three. If you want a room for yourself we charge an extra €280 for the week. Just for participants we offer the opportunity to stay an extra night before and/or after the event for €45 in a shared room or €80 in a single room. Airport transfers can be arranged by Windtown and cost €85 one way. You can share the transfer car with max. three persons to split costs. Or you could rent a car for the week if you also want to explore the area in the free time. R1.300,- for an airport transfer (one way, max. 3 people). R1200,- for an extra night in single room. M&M SUP Amsterdam and SUP Curacao offer this week filled with paddle boarding, yoga, windsurfing, a hike and plenty of beach and chill time on the lovely island of Curacao. Always wanted to paddle the mangroves go for a downwinder on the blue warm ocean, try windsurfing in warmer waters, practice yoga on a Caribbean beach and snorkel the beautiful warm waters of Curacao? This is your chance. Price €1150,-if you book before 5th december you pay €999!!! The program might change due to weather circumstances. We will always make sure that we offer another activity if we have to cancel something due to weather changes. If you feel like exploring the island on your own or together we recommend you to rent a car. Rentals are relatively cheap especially if you share the cost/car. *During your stay you share a 2 person bedroom in one of the appartement. The apartments are all fully equipped with a kitchen, bathroom and living room and even a shared swimming pool. *If you have any additional questions or requests don't hesitate to contact us. *We offer this week for everyone so you do not need to have any paddle and/or windsurf experience. It's about having a good time! *As soon as we have enough sign ups (6persons) we will give the GO! The last chance to paddle Amsterdam by night and light during the Light Festival! Paid parking at the Dijksgracht just a 200 meter walk from the bar where we meet and start of. Also with own gear we need a sign up! For experiences paddlers only as the tour is about 8-9 kilometers! Because we paddle in the dark everyone should wear at least one headlight and a front and back light on board or body so we are seen by other water users and everyone should dress in wetsuits or drysuit. The yearly Amsterdam Light festival is organised in Amsterdam again, Along the canals artists have created light objects that are best to be seen while being on the water. 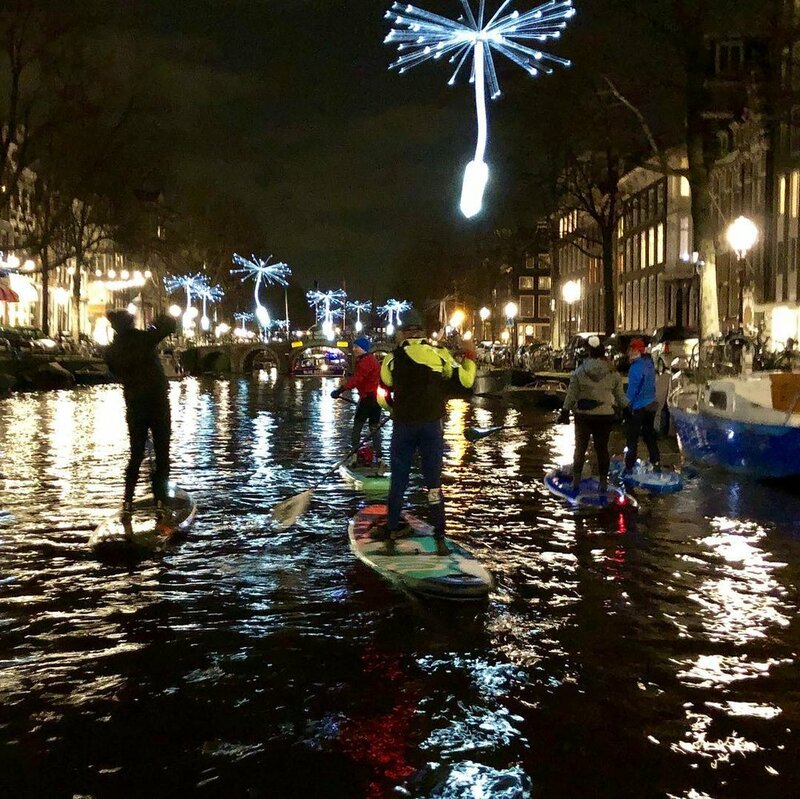 Last week we paddle the Amsterdam night and light paddle with a small group and enjoyed it so much we organised a second one in the new year! Next to all the object we see along the way it’s also super special to paddle through the Amsterdam canals and all it’s beautiful houses all lit and looking so very beautiful! If you want to join this special sup tour we can take you just send us an email: morene@mm-sup.com If you can’t make the 9th just let us know when you would be able to make it and perhaps we cans et up a private paddle together. Slovenia sup safari - VOL! Day 2 Paddle Ljubljanica river, that meanders through the marshes arround Ljubljana, then we paddle below bridges of Ljubljana to Ljubljana old town. You have two length options longer apr. 28 kilometers downstram, if that's too long we can also make a shorter 18 kilometer paddle. This is to discuss on spot and each participant can choose one of both distances. After the paddle transfer up to lake Bled area. Day 3 An early rise and paddle the beautiful lake Bled – approx. 4 km. After lunch we will paddle alpine lake Bohinj – approx 8 km paddle. After all the paddling we will hike up to a Savica waterfall. It's a short 20-30 min hike. Accomodation in lake Bohinj area. Day 4 Take the car-train to Soca valley early in the morning and paddle the turqouis waters of alpine Soča river after arrival. Overnight stay in Tolmin. Day 5 Driving back to Ljubljana area (approx. 3 hour drive) and last short paddle tour at Trboje lake/gorges of Sava river if we will have enough time regarding flight schedule. After the tour time to pack up and get ready for flights home. Transfer to the airport. *If you want to rent an inflatable touring board and paddle the rental cost is €70 for 5 days. As this SUP Safari is already in 2 months we need to know a.s.a.p. if you will be up for it and a sign up + 35% downpayment to book the hotels + van + train tickets. Deadline for booking and (down)payment is 15th August. Because we like to discover new places by paddleboard we organise this fun paddletour in the city of Leeuwarden in coop with Supskool Leeuwarden. We leave at 14:00 for a 2 hrs tour though the city of Leeuwarden and will paddle for about 6-7 kilometers so a biut of paddle experience is required. Rental gear is available for €25 and attending with your own gear is €10 After the paddle tour there are some drinks and little bites available for you at the Stadstrand where we will take off. We are happy to work with M&M SUP Amsterdam for the first certification in the Netherlands. Because it's fun to travel around Holland and paddle on new waters we offer this 1000 island tour in Broek op Langendijk in coop with sup school Leersup.nl. Let's get lost in between these thousand islands, enjoy nature and the sunset in the North of Holland together while paddling. The route is about 7 kilometers so a bit of sup experience is needed to attend this tour with us. Please be ready to take off at 19:00! In coop with IKSUP in Loosdrecht we offer a tour at the Vuntus nature area. We meet up at 10:30 at Oud Loosdrechtsedijk 191. There we can dress up and leave for a tour in the silent natty reserve where we even might spot some deers and other animals along the while paddling the greenish islands that make Vuntus such a special area to paddle. The tour is for experienced paddlers. Cost €30 if you want to rent a board and €15 if you bring your own gear. After the tour we provide a free drink. After the tour you can have a lunch next to IKSUP at jachthaven Wetterwille. Sign up via morene@mm-sup.com You have to sign up for this tour and as we have limited rentals available we also need to know if you need gear! We verzamelen om 18:30 bij Brouwerij 't IJ - Funenkade 7 vanaf waar we de stad doorslapen en langs diverse highlight zullen suppen zoals de Magere Brug. A long weekend at the Spanish Costa Brava coast in the little fishers village 'El Port de la Selva' near nature reservation 'Cap de Creus' for some stand up paddle boarding and (sup) yoga. We offer this long weekend together with the local sup & wind surfschool Adosveles owned by the Dutch Heleen Muijsers. A 4 day and 3 night weekend filled with sup, yoga, sup yoga and beach time! This weekend is for all levels! *The program may change due to weather circumstances. We offer a bed & breakfast that sleeps 8 persons (4 double rooms) and is fully equipped. We share our breakfast there together in the morning. Flights to Girona are easy to find and book. From Girona it's about a 45 minute drive to El Port de Selva. A rental car that sit's 4 personen is about €25,- per day, perfect to share. Check Transavia.nl direct flight to Girona the 31st May 6.30 arrival 8.30. Return the 3rd June 22.20 arrival 0.30 in Amsterdam. Price is around €150,- for a ticket. It's also possible to book a flight to Barcelona but the drive from Barcelona airport is much longer. If you want to paddle more then we offer it's also possible to rent a paddle board whenever you want for €10 per hour. Adosveles also offers windsurfing classes and gear for anyone who is up for some windsurfing. If you want to extend your stay or arrive prior to the 31st of May let us know so we reserve you a bed/room. Price for this long weekend is €495,- which includes accommodation (three nights in a shared room), all activtities as on the program, transport to activities if needed, 3x breakfast, and picknick during our long paddle tour. Let's go out and enjoy the Full moon on the water while paddling. Samen met iksup uit Loosdrecht organiseren we op 25 mei een sup tocht door Amsterdam. We starten bij de Molen - Brouwerij 't IJ - Funenkade 7 in Amsterdam en zullen een leuke ronde door de binnenstad suppen langs hoogtepunten zoals Artis-Amstel-Magere brug-Hermitage-Scheepvaartmuseum-Nemo. De suptocht duurt twee uur dus het is wel handig als je al wat sup ervaring hebt. Wil je meedoen dan kan je je inschrijven via morene@mm-sup.com of info@iksup.nl Een huur board kost €30 en meedoen met eigen materiaal €15. Omdat we in Nederland altijd wat laat van start gaan met het voorjaar, en al eerder zin hebben in een paar dagen suppen op zee. In samenwerking met Moloka'i supcenter in Barcelona een sup weekend aan het begin van de lente! Omdat Barcelona zo'n toffe stad is zorgen we ook voor genoeg vrije tijd naast het suppen om de stad te ontdekken, lekker op het strand te hangen en te genieten van de chille vibe die in dit oude gedeelte van de stad hangt! We hebben voor dit weekend slechts plek voor 7 mensen dus boek snel! 20 April : SUP Trip buiten de stad, naar een van de mooie baaitjes die de omgeving rijk is. Vandaag zijn we de gehele dag op pad met sup-bus en sups. 22 April: Een vroege sunrise sessie, daarna of zelf nog vrij suppen of de stad verkennen totdat het tijd is om terug naar huis te vliegen. Je betaald €565 voor een kamer alleen en €425 als je een kamer met twee deelt. Deze prijs zijn voor 3 nachten, inclusies ontbijt, alle sup activiteiten, sup materiaal en het vervoer tijdens de supttocht. Het hotel is kleinschalig modern en stylish ingericht, het ligt op een klein kwartiertje lopen van Moloka'i sup center in Calle Meer, 200 meter van strand en zee. Het sup center beschikt over bomkleedhokjes, douches en kluisjes. Vluchten vanuit Amsterdam gaan een paar keer per dag en zijn in deze periode te boeken voor €100-€150. Een taxi vanaf het vliegveld naar de stad is ongeveer €30 en als je met een paar anderen van dit weekend deelt goed te betalen.